2018 review by James Loveridge. 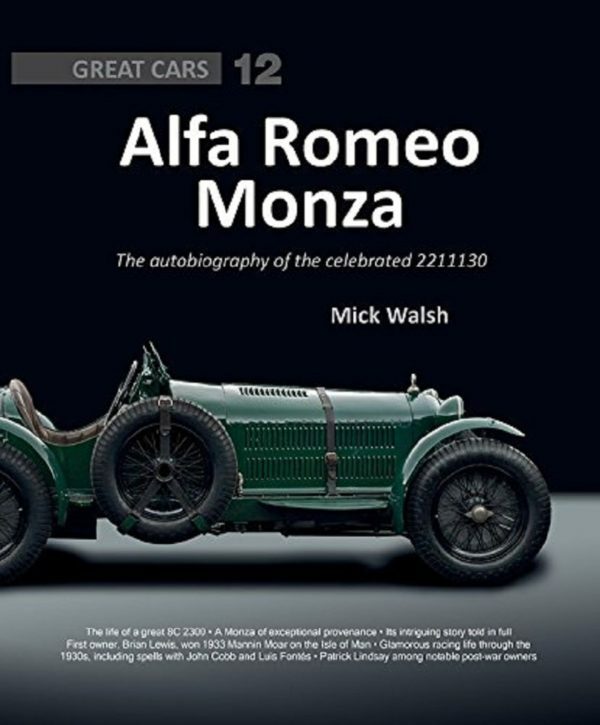 Mick Walsh, well known Journalist and concours judge, has written a Love Story under the title “Alfa Romeo Monza: The autobiography of the celebrated 2211130”. The subject is the well known Alfa Romeo Monza 8C 2300 with that chassis number and the British Registration FYE 7. This book is number 12 in Porter Press International’s series of Great Cars. The book not only tells in great detail the history of this splendid car from its purchase new in 1933 virtually to the present day but also puts that into context with a very full account of these very special cars and the significant part they played in the golden period of 1930s motor sport. This was the era when the cars you saw on the track were not so different from the cars you could, if you were wealthy enough, buy and use as your road car. What’s more these Alfas, like other contemporary makes, were used as sports cars in such road events as the Mille Miglia and the Targa Florio, but also ran stripped as competitors in the then Grand Prix events such as at Monza (obviously) and Montlhéry. It is in no way an expensive “rivet counters” book but will be of interest not just to those who have a special regard for this car like Mr Walsh and Alain de Cadanet who has provided a knowledgeable Foreword to the book but also to those who appreciate this special period of motor racing. The book, written with the obvious passion the subject deserves, runs to 317 pages plus an index. It is profusely illustrated with photographs and drawings to a standard of reproduction comparable to that of Palawan Press or Dalton Watson. Mr Walsh has divided the book into four sections: The Monza Story; Pre-war life of 2211130; Post-war life of 2211130; and Anatomy of 2311130. The first part introduces us to the people involved with the cars such as Jano (the designer) Ferrari (the entrant) and Nuvolari, Campari and Ascari (the drivers). There is a very detailed account of the competition history of the “Monzas” in top level International Motor Sport over the years 1931 to 1935 both on road and track. It seems “our” car was never used by the factory or Scuderia Ferrari as a competition car but was sold new to a Mr. Noel Rees, a successful English house-builder and the second and third sections of the book detail the car’s life from then. Extensive coverage is given to the well known individuals who were fortunate enough to own or to drive the car and in some cases both. The list stretches from the Hon Brian Lewis through Sir Tim Birkin, Lord Howe, Luis Fontes (the “forgotten” Le Mans winner) to, after the war, The Hon. Patrick Lindsay and others. Personal experiences of the car are recorded and Mr Walsh is well able to comment knowledgeably from his vast experience of quality cars and having himself driven this one. The final section is 10 pages long including some nice detail photographs and is informative enough to satisfy all but the anoraks! The book retails at £60 – a competitive price for something of this quality. Price: £60. 320 pages (280mm x 230mm), hardback in dustjacket.